You feel at home. The beautiful family knows what you need before you do. Everyone is very helpful and at the same time discrete. The facility is beautiful and comfortable but at the same time not over the top and well integrated in the island. Welcoming people. Family business. One step to the sea. Wonderful family hotel. Great pool. Right on the beach and stunning views across to Athens. Terrific customer service. Superb location on the see . Very good pool with salt watter . The yard of the hotel is very , very nice , with a lot of plants . The people was very nice and helpfull. The appartment was big , clean and had an amazing view . Maybe more attention to the detailes . The fridge was old , things like this . Amazing, intimate, family run hotel. Not too big, in a beautiful location and stunning grounds. Staff so lovely and friendly. It was just a paradise! Comfortable room, great views, nice resting area with pool, playground etc. And most helpful and nicest hosts. Lock in a great price for Irides – rated 9.6 by recent guests! Irides is located 100 feet from the sea. 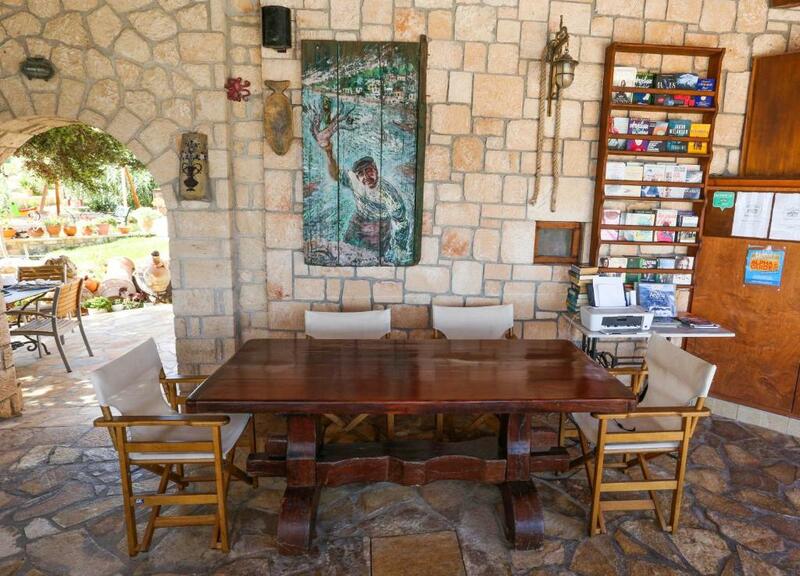 It is just 1.6 mi east of Souvala village on the north side of Aegina Island. It features an outdoor, salt water swimming pool with sunbeds and pergolas. All rooms have a sea-view balcony and are air conditioned. Fitted with Coco-mat mattresses, they include a kitchenette with kitchenware and refrigerator. Facilities also include a satellite TV with DVD player. Breakfast at Irides is served daily in a shaded area by the pool. During the day, guests can also enjoy various snacks, daily dishes and drinks pool-side. Two taverns can be found at 650 feet. The facilities include a beach volleyball court. A playground for children, as well as outdoor chess are provided. 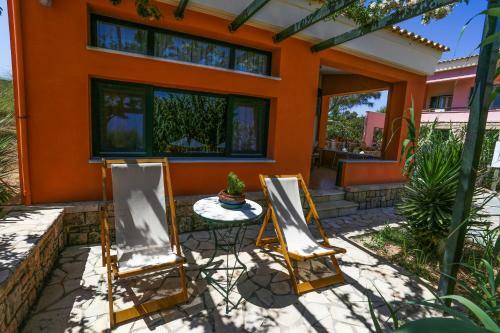 Staff can arrange various activities such as, hiking, horse riding, music events, cooking workshops and barbecue nights by the sea. Irides is located 6.2 mi from the port of Aegina and 5 mi from the port of Agia Marina. Free private parking is possible on site. Free Wi-Fi access is available in public areas. This property also has one of the top-rated locations in Souvala! Guests are happier about it compared to other properties in the area. This property is also rated for the best value in Souvala! Guests are getting more for their money when compared to other properties in this city. When would you like to stay at Irides? 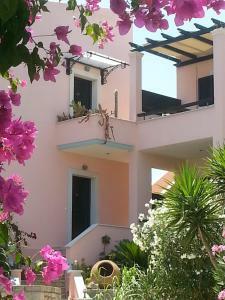 Studio includes a furnished balcony with view of the sea and the pool. Features a kitchenette, satellite TV, DVD player and safety box. Loft is a split level apartment. The lower level has 1 double bed and the upper level 1 single bed. It also has a furnished balcony with sea view. Family Suite features 2 adjoining rooms with one double bed and 2 sofa beds. Some are located on the ground floor and have a furnished patio offering sea views. Others are located on the first level and have a furnished balcony offering sea views. 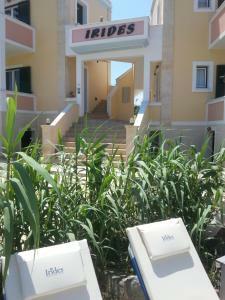 Air-conditioned villa offering sea views. It features a well-equipped kitchenette, a flat-screen TV and a safe. 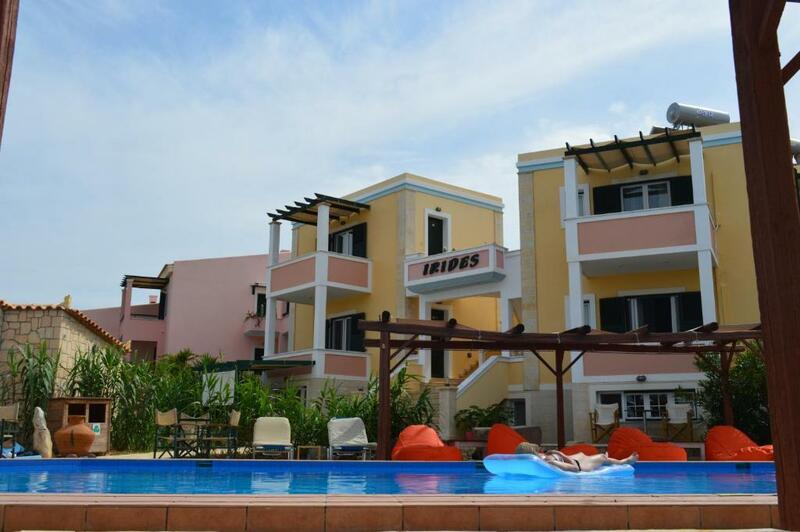 Irides is like a small hotel - resort situated right next to the sea. You can wake up with the sound of the waves, watch the sunrise above the mainland and start your day with a lovely walk next to the sea. Have your breakfast at our poolside and enjoy the sun & sea afterwards. House Rules Irides takes special requests – add in the next step! Irides accepts these cards and reserves the right to temporarily hold an amount prior to arrival. Please inform Irides of your expected arrival time in advance. You can use the Special Requests box when booking, or contact the property directly using the contact details in your confirmation. A damage deposit of EUR 100 is required on arrival. That's about 112.55USD. This will be collected by credit card. You should be reimbursed on check-out. Your deposit will be refunded in full by credit card, subject to an inspection of the property. Our tripp was to short . Very nice place to spend a good vacation. Comfortable bed, clean spacious room with a small fridge, sink and tableware, which is good if you want to keep some local fruits or yogurt. Romantic view directly from the room window and balcony. Good breakfast including home-made food served near seaside. Owners are so friendly and always ready to help in any question. They speak good English and German. All buildings, rooms, garden and decorations are created with touch of a good designer. And all stuff is of a good quality. Area contains plenty of different things to spend time in any way you like (have fun, eat, lie, relax, sunbath or swim). Nice pool with seawater. Fantastic sunsets! The place is not very close to the towns and local landmarks so you will need a car (can rent it. Or a bike) or be ready to walk by foot a lot. 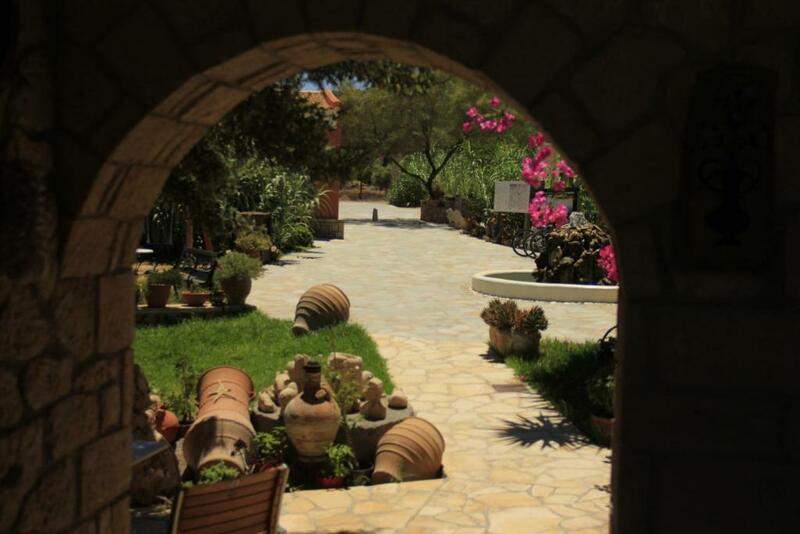 I walked to the Temple Ἀφαία and back by foot with pleasure through the pass of culture with spectacular views and delightful smell as you have to go through lovely pine trees, pistachios and olives alleys. Aegina island in general is very quiet and peaceful with cute cafes and taverns with fresh sea-food and also charming views. I recommend this place and hope to be back when travelling to Greece. It inspired me for painting, photography (see attached) and made me completely relaxed in just a week. Nothing, it was great. However make sure to have a car (we did) to get around, it's quite far away from everything. The place was beautiful, right by the sea. Very nice hotel-apartment, felt more like a hotel which was what we were looking for. Clean rooms, nice staff and a relaxing atmosphere.